Stylus Profile: Spherical Diamond, Tracking Force: 3 to 5 grams, Colour: Red (may vary). 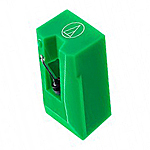 Replacement Diamond Stylus Ref 392D compatible with Sanyo ST09D as fitted to cartridges for Ion GT USB, IDJ03, iProfile, IPT01, ITT02A, ITT03, ITT05, ITTcd10, ITTusb, ITTusb05, ITTusb10, LP2CD, LPDock, Profile LP, Profile Pro LP, TTusb, TTusb5, TTusb10 record players, plattenspieler. Note - this stylus replacement has a finer spherical tip profile for vinyl single (45 rpm) and LP (33 rpm) record playback and should not be used on 78 rpm records which require a broader sherical tip profile. 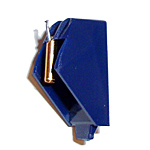 Replacement Stylus Ref 392D78 compatible with Sanyo ST09 78 for cartridges on Ion ITTUSB 78 rpm record players.